I don’t often share obituaries on my blog but this one is an exception as it is about an unsung hero: Todd Bol, whose Little Free Library brought books to the street corner. He died Oct. 18 at a hospice center in Oakdale, Minn. at the age of 62. We need to cut back on resources, and you’re the resource we’re cutting back on. A year later, and no closer to figuring out his next endeavor, Bol repurposed wood from his garage to build a dollhouse-size library in the shape of a one-room schoolhouse. He decorated the structure with a steeple and a tinny toy bell. He painted the library red, using bright white paint for its wood-shingled roof, and crafted a glass door to secure a few of his parents’ favorite books. Then he set the library outside his home in Hudson, Wis., atop a wooden pole with a sign reading “Free Books.” And he waited. By the end of the year, he had made and given away 30 of the libraries, building them on his home deck before enlisting an Amish craftsman named Henry Miller to assist him in the work. Bol then set an ambitious goal for himself. Because Andrew Carnegie had built 2,509 libraries, Bol decided he would build 2,510. 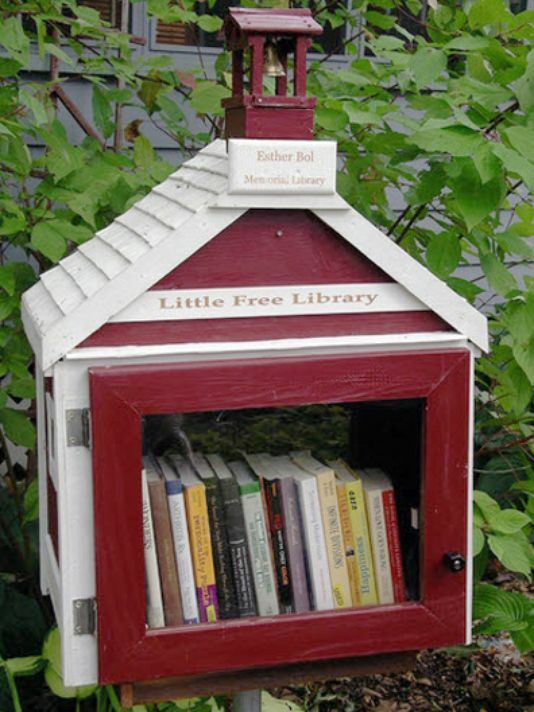 There are now Little Free Libraries in all 50 states and in 88 countries, from Australia to Brazil, Ghana, Japan, and the Netherlands. They stand inside police stations, subway stops, prisons, hospitals, and even at a refu­gee camp in Uganda. Inside each are about 20 to 100 volumes of whatever a community decides to donate. If they get any bigger than that, I hurt my back carrying them. Little Free Libraries, primarily made by Miller and other Amish craftsmen in rural Wisconsin, start at $150. The organization also offers blueprints and instructions for those who want to build the book-exchange boxes on their own. For $40, builders can join the Little Free Library network, which lists the library on an online map and offers discounted books and other benefits. Folks have Little Free Libraries shaped like rocket ships, robots, Victorian mansions, black cats, everything under the sun. One is shaped like a life-size TARDIS. Others are done in birchbark by Native American artists. There’s a bright yellow one emblazoned with characters from The Simpsons, autographed by series creator, Matt Groening. Others are housed in repurposed suitcases, storage cabinets, or newspaper honor boxes. In recent years, the organization expanded to offer programming including the Action Book Club, in which books are tied to group service projects, as well as an initiative to place Little Free Libraries in underserved communities at no cost. The organization has also spawned imitators, including community boxes built to hold basic hygiene products and canned goods and toiletries. Their creation offers additional proof that, while the books were free and the boxes were unguarded, there was hardly any vandalism or theft. What we have found is that the neighborhood starts to feel like it’s theirs. The neighborhood starts taking care of it. People come together to talk about literacy, education — community things that we define so well but lack so much. There is such polarity these days that this is a little commonplace that we’re comfortable with. Which probably explains why, when an arsonist torched a Little Free Library in Indianapolis, the community rallied, vowing to replace it with 100 more. Thank you for posting this, Nicholas. While I love Little Free Libraries (who doesn’t), I didn’t know the history and the story behind the creator. RIP, Todd Bol. You made a difference! At least, he’s leaving behind a great legacy. He sounds like an amazing man. So many lose their jobs to so-called growth. Thanks for sharing his story, Nicholas and condolences to the family. Couldn’t agree more, Jacquie. Thank you! You are brilliant at sharing such deviled out things for those of us who knew ‘vaguely’ but not the wonderful vision of the originator! Thanks Nicholas. Sad loss of a visionary. They don’t all wear saffron! I saw my first Little free library in Tomich, Scotland. Such a wonderful idea, and we owe thanks to Todd indeed. A sad loss, at a young age. My feelings exactly. Thank you, Pete! Thank you, Nicolas, for sharing his story. We have a sharing library out front of our church. I often wondered how it got started, now I know. Another example that loving our neighbor is not dead.